Pastor Vickie Kintzel journeyed with us in faith from September 2017 through June 2018. 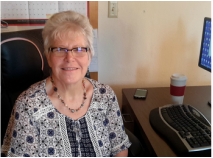 She has now retired from full-time ministry and returned to Longmont, where she looks forward to the next chapter God has planned. She also will relish more time with her husband of 46 years, and to being full-time in-town Grandma! Watch this space for an introduction to Pastor Debbie Upton in the near future. In the meantime, join us in worship at 8:30 in Center or 10:30 in Saguache to meet her in person (on or after July 1). ​Charleen spent 35 years in the Center Middle School/High School before they built the new buildings across the street from the church. While serving there as first a teacher and then the Middle and High School Principal, she saw three generations of children move through the system so she is sort of an institution in the community. She is semi-retired, currently recovering from ALL (a type of leukemia) and about to celebrate three years of survival after a bone marrow transplant in August 2015. She is mom to a tall Boston terrier and a short little fawn pug, both of which are very spoiled and becoming geriatric in age. She loves to read, embroider, bead, visit with friends, go to concerts, raise violets and do gardening activities when allowed to do so by the doctors. Charleen is a member of the church and encourages everyone to join in on bible study, and to come and invite someone to join us at the monthly "Cooking with your neighbor." She still loves doing things common to her home economics background and she loves her part time job here at the church.